Your search for spacious and practical meeting rooms in Gurgaon to meet the visions or to present your dream project to your esteemed clients ends at Altrade Business Centre which is situated in an outstanding location in Gurgaon. Meetings have a critical and vital impact on any business, hence, the environment and ambiance of a meeting place must represent you and your business to get the business deals settled. Our meeting rooms are the perfect territory for that fundamental business meet which is crucial in decision-making. Our meeting offices give a perfect set-up supporting a bunch of meeting room services which is ideal for personal meetings, seminars, official meet-ups and training sessions. Altrade Business Centre has an unmatched association in arranging effective gatherings and conferences along with the group of experts who focuses on even the slightest detail and gives specialized support for the smooth flow of meetings. 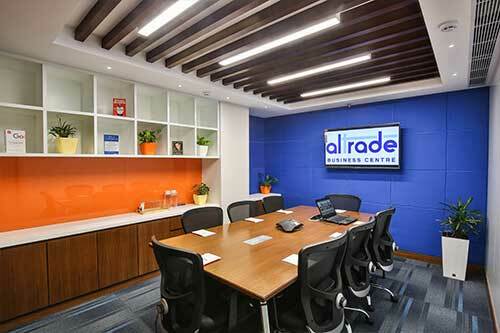 Altrade Business Centre offers flamboyant meeting rooms in Gurgaon, completely outfitted and furnished with the latest equipment for communication including audio and video teleconferencing technology. Our meeting room facilities also include complimentary refreshments, top-notch presentation facilities, high-speed internet access and in addition, different enhancements for your client’s solace and comfort. You can reserve the meeting room of the size which suits your purpose, your timings and your location.